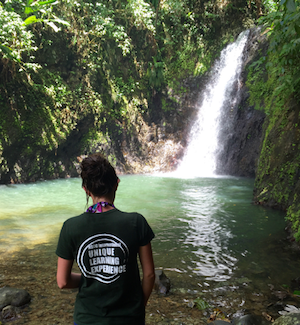 Cultural Entrepreneurship & Documentation Program Grenada – On May 16th myself, four other NSCC students, three NSCC faculty and one tour guide hiked to Seven Sisters Falls in the Grand Etang Forest Reserve. When we left the hotel we were all excited to see the falls but I don’t think we were fully aware of the experience we were about to have. Along the steep winding roads through the rainforest, Lennox, our tour guide asked if we recognized different fruits, plants, lakes, towns and trees. I think everyone except Lennox learned a new plant. My personal favourite was seeing a Eucalyptus tree for the first time. When we arrived at the beginning of the hike our guide insisted we take a walking stick that was provided and I’m thankful he did. After walking along a fairly wide and well-traveled path and being taught about many more plants we arrived at the top of a short hill under a large tree. Once we all gathered Lennox asked us to close our eyes for a short minute. He asked us to tell him about the different sounds we heard. Just as we were about to start our hike it started to down pour, it had rained on and off along the drive but this was a lot. We laughed and started our hike as the rain drifted to a stop. We hiked along a steep slippery path for about twenty five minutes until we reached the falls. It was beautiful. We had the opportunity to swim, sit, snack and truly enjoy our surrounding which Lennox had so perfectly prepared us for. I believe this hike was a perfect example and way to learn how to be completely present and grateful.